The devil is in the details when examining the health of the Revenue Cycle (RC) ecosystem. Sometimes figures and reports don’t tell the entire story. What may look like a sound days in accounts receivable (AR) measurement (e.g., 30 days), can actually mask systemic problems in processes and procedures. If data reported are inaccurate, miscalculated, or outright corrupt, leadership may not learn about the issues until revenue wanes. 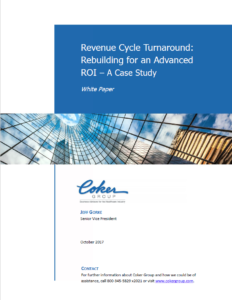 This paper will use a real-world case study to illustrate the signs of an in-danger RC that can be overlooked and how Coker helped one organization turnaround a 14 to 1 return on investment (ROI). The health system’s situation will be reviewed to show their struggle with their RC as a new Chief Operating Officer (COO) wondered why things were not moving ahead smoothly for the several-hundred provider organization.